Today, we look at an odd duck: a Peanuts story. 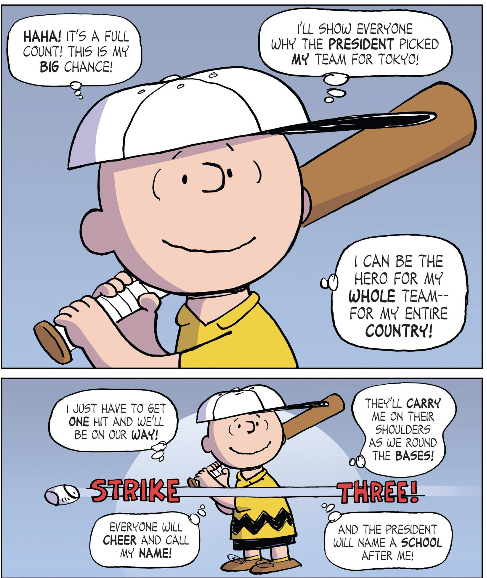 Only it’s not from the classic comics by Charles Schulz, it’s instead a long-form post-Schulz comic book in which Charlie Brown and friends go to Japan after being selected to represent America as Little League ambassadors. Hilarity ensues. Released in 2012 by KaBOOM! Press (part of BOOM! 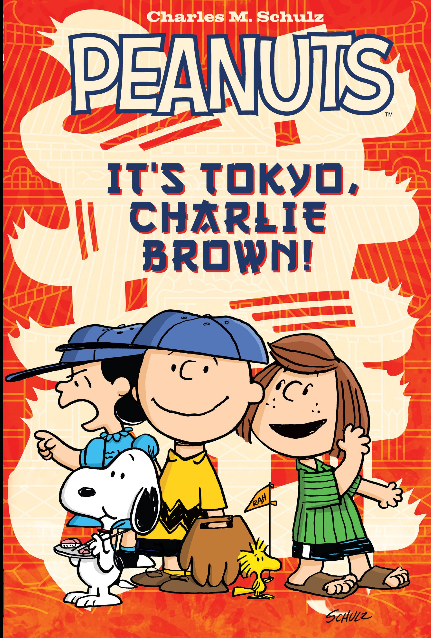 Studios) and authorized by the Schulz estate (which provided the actual creative team), It’s Tokyo, Charlie Brown! was written and penciled by Vicki Scott and had colored by Paige Braddock. Both had worked as assistants at Schulz’s studio before his death, which famously occurred the day his final Peanuts strip came out. In fact, Braddock apparently did the inking of the comic using a pen nib that “Chuck” had given her. Still, I don’t know, despite that pedigree, I’m not so sure about this. I mean, I’m still weary about the the upcoming Peanuts CGI film, despite the fact that it’s teaser trailer was actually pretty good. It only says “Charles M. Schulz” because they are his characters and he did the original drawing of them in baseball garb. All images, characters, etc. belong to their owners, whether of copyright, trademark, etc. Screenshots are only used, under fair use, to emphasize the points and observations made within this post. General spoiler warning- I will reveal the end of this. Poor old chuck. Another loss in the column. 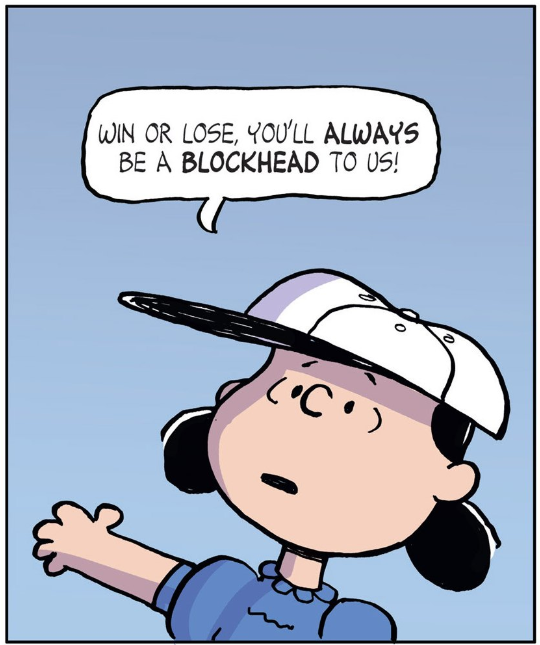 And, this being Charlie Brown, Lucy and the rarely-used Patty (not to be mistaken for Peppermint Patty) spend time telling him he’s a blockhead in a rather funny little gag. Eventually (off-panel), the girls stop, and Chuck talks a bit with Schroeder, where we get a rare statistical look at Chuck’s futility (it has been done before, but rarely has it been stated in-comic). Schroeder remarks that, this past season, the team went 0-20, giving up 3,040 runs while scoring only 6, giving up 4900 hits while only having 11, and making 300 errors while the opponents only had 19. 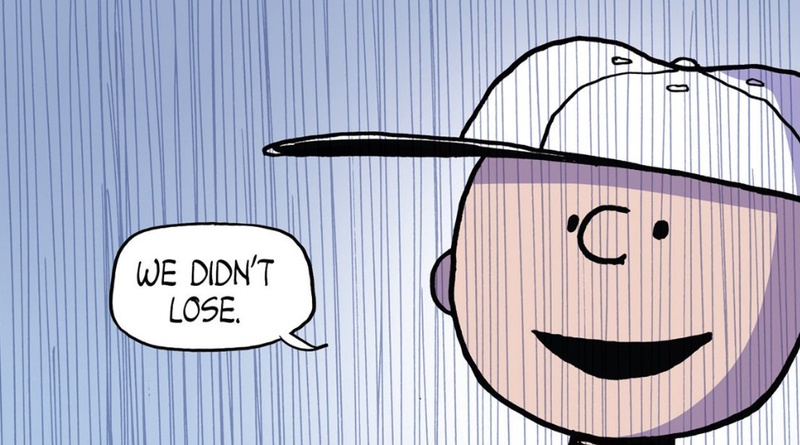 The Peanuts team almost won one game by forfeit, but then the other team showed up. 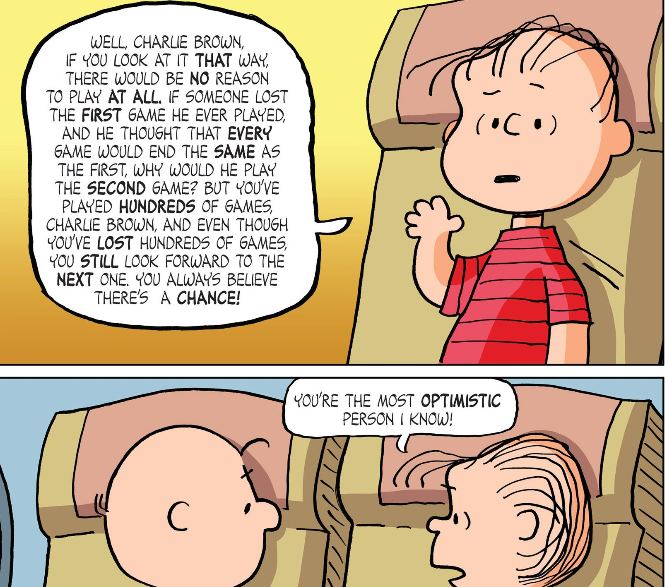 Now, Schroeder might be exaggerating here, but if he isn’t, it means the average game for Charlie Brown’s team saw them losing 152-0, giving up 245 hits a game while usually being no-hit, and committing 15 errors per game. The hits and runs for the Peanuts gang seem a little low given the fact that Snoopy canonically was neck-and-neck with Hank Aaron in the race to break Babe Ruth’s record, but I guess that could explained by the fact that maybe he was too busy fighting the Red Baron or something during a few games. 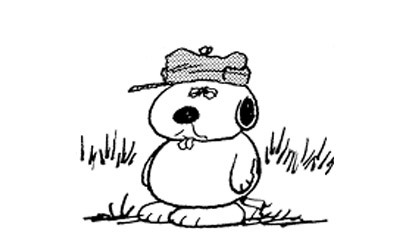 Anyway, the collected WAR of the Peanuts gang (especially when Snoopy isn’t hanging out) is probably so below replacement level that not even Pablo Sanchez could help them. No wonder ole’ Chuck is happy that baseball season is over. 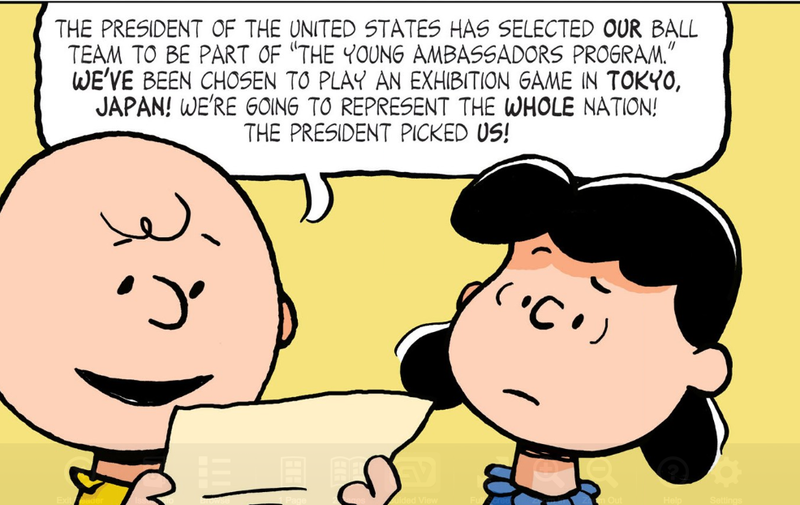 Yes, for some reason, the President has decided to send the Peanuts gang to Japan to play a baseball game. I can only presume that the President lost a bet and had to send the worst possible little league team over. He’s right. Charlie Brown could have quit years ago, and yet, he keeps on plugging, trying to win that game, kick that football, kiss that little red-haired girl… good old Charlie Brown. 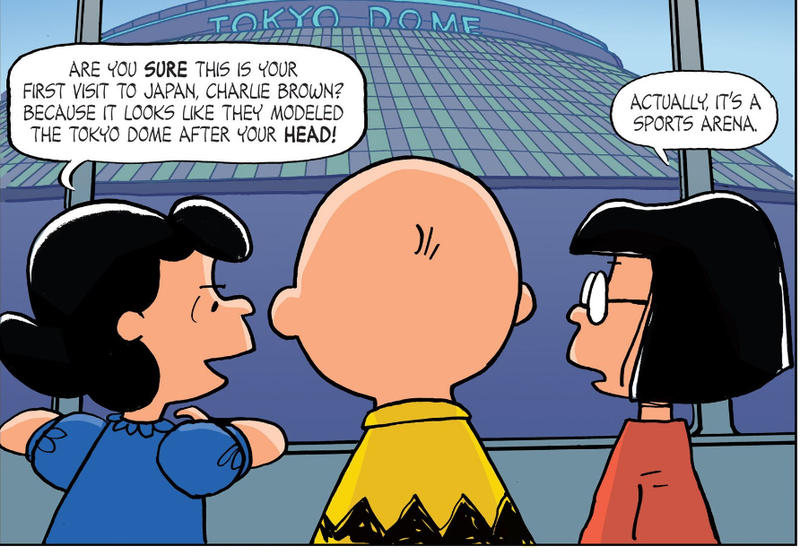 Once they get to Japan, the comic turns into something of a travelogue, allowing Marcie to teach kids reading this about important Japanese landmarks and cultural features, like Mount Fuji, pagodas, Buddhist shrines, and, uh… the Tokyo Dome. Actually, a good chunk of this book from when they land until they actually play the game is a neat little look at Japan for kids. It sort of reminds me of some of the Peanuts specials and movies that I watched on VHS as a kid. One movie, Bon Voyage, Charlie Brown (And Don’t Come Back!! ), for example, had the gang visit England and France, and then it had a sequel (What Have We Learned, Charlie Brown?) that had them visit more sites in France and also Belgium. Another one had them go to the Smithsonian or even Outer Space. While they would have plots, a good chunk of the fun would just be seeing how the gang would interact with whatever culture or topic they were dealing with. 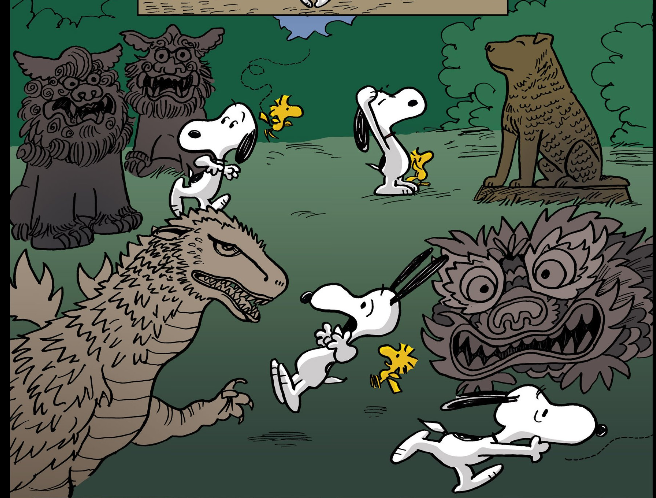 Snoopy gets creeped out by some komainu (lion-dog statues meant to ward off evil spirits), pays his respects to Hachiko (an Akita dog who famously waited loyally for his owner to return from the local train station, even years after it’s master had passed away), and basically loses it when Godzilla and a Asian dragon statue are seen. 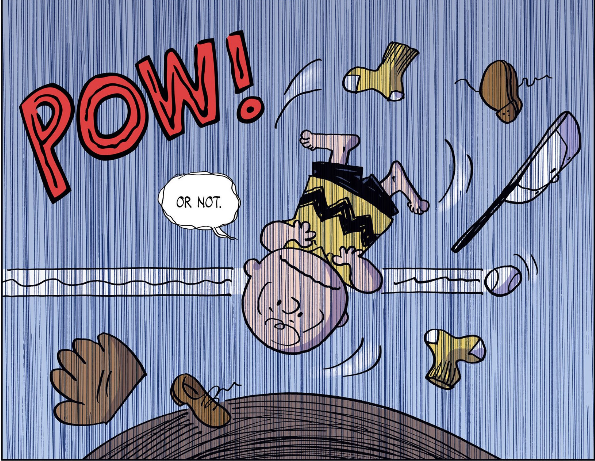 Although Lucy, predictably, strikes out to begin the game, Linus is able to get on base after getting hit by pitch. 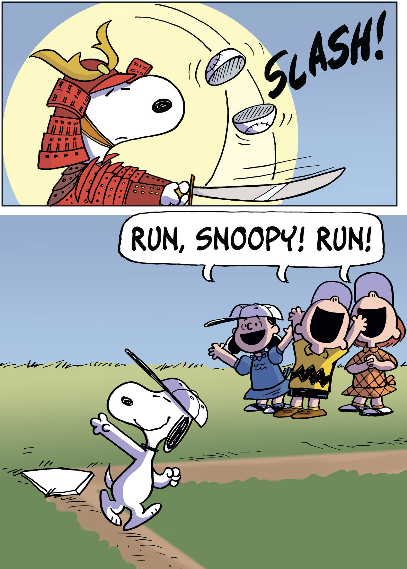 Schroeder then strikes out, but then Peppermint Patty whacks a hit to have two on and two outs in the top of the first, and then Snoopy, summoning the power of the samurai, gets a single to load the bases for… Charlie Brown. And this leads to a great error on Chuck’s part: what type of lineup is this? Lucy is unquestionably your worst player, and you have her at lead-off. 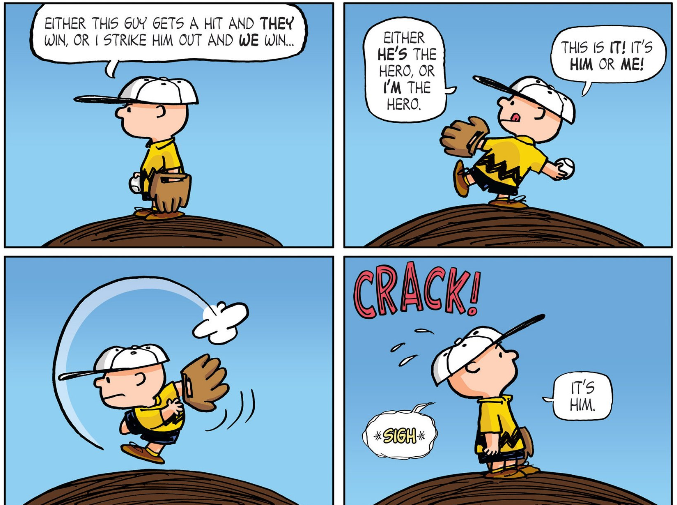 Having Peppermint Patty hit clean-up is a good move, but having Schroeder hit third isn’t. 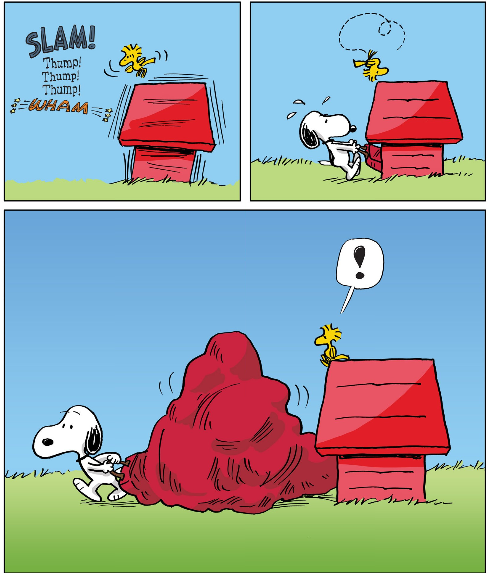 It would be far wiser to have Snoopy, by far his best player, hit third, with Schroeder or perhaps Linus (who has been shown to be one of the team’s less-horrible players in the past) in the five-spot. And he really shouldn’t have himself hitting anywhere in the first six slots in the lineup. 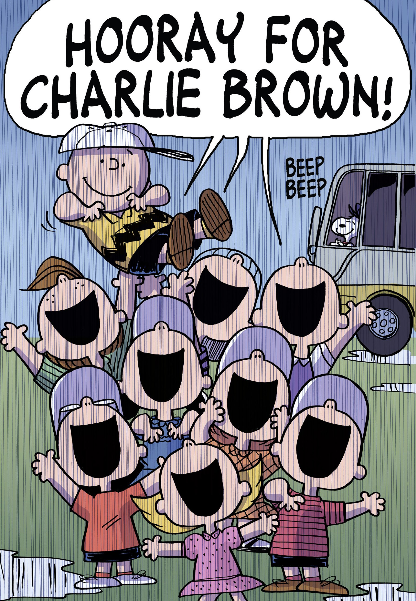 Clearly, Charlie Brown is of the Ned Yost school of nonsensical batting order. …Sorry, I got distracted there a second. Anyway, Chuck’s able to work a 3-2 count, and starts to day-dream of his glorious bases-loaded walk. And that, alas, is Mr. Charles Brown’s downfall. So, to the bottom of the first. Charlie, as usual, has himself pitching, another questionable move, considering that he has Peppermint Patty on his team right now and she is a better pitcher than him. 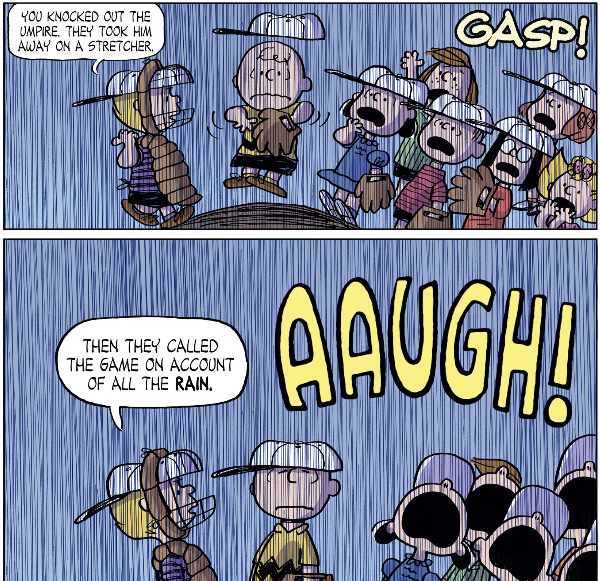 Anyway, as rain starts to fall (uh oh), Chuck gets two strikes on the Japanese lead-off man (in keeping with Peanuts tradition, we never truly see the opponent), and starts thinking that this time, he’ll be able to not only win, but throw a no-hitter! Oh, Chuck, why do you do this to yourself…. 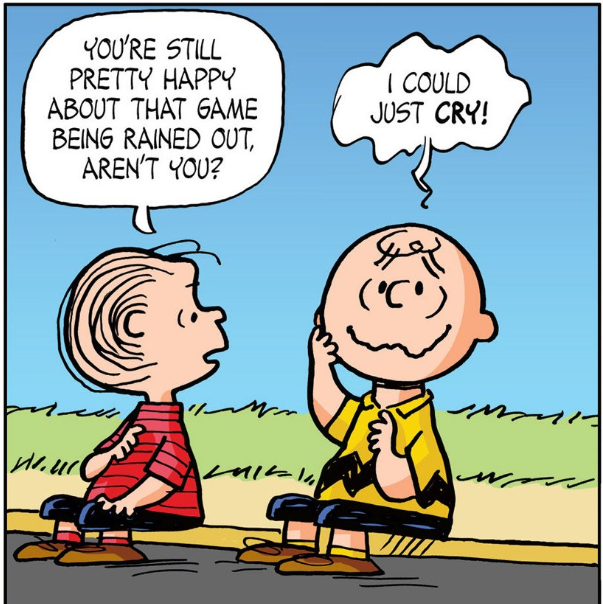 Yes, Charlie Brown, you did it. You didn’t lose. You didn’t win either, but for you, simply not losing is enough for all your friends to launch you into the sky. Okay, that was actually pretty good. What’s more, the digital version of it you can find on Comixology has some interesting behind-the-scenes stuff, too. It’s very obvious that the people who did this very much cared for the Peanuts gang. Well done. 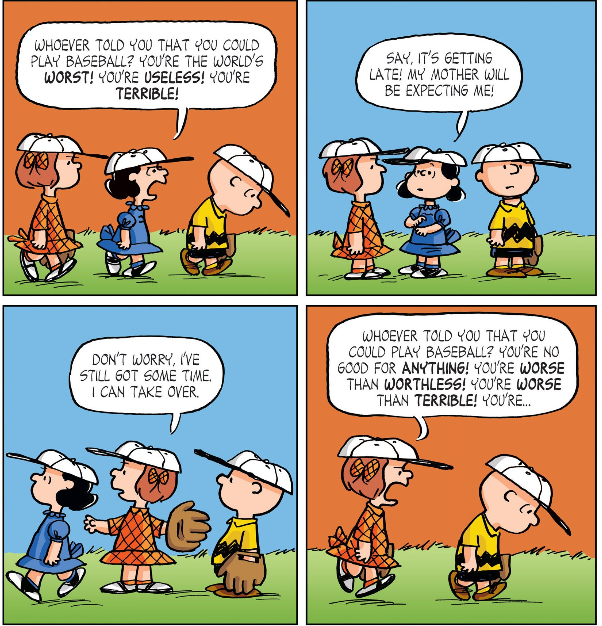 This entry was posted in Baseball, Books and all their spinoffs, International, MLB, Non-Baseball, Uncategorized and tagged baseball, Bizarre Baseball Culture, Charlie Brown, comic, comics, graphic novel, It's Tokyo Charlie Brown, Japan, Little League, Peanuts, Snoopy by danglickman. Bookmark the permalink.